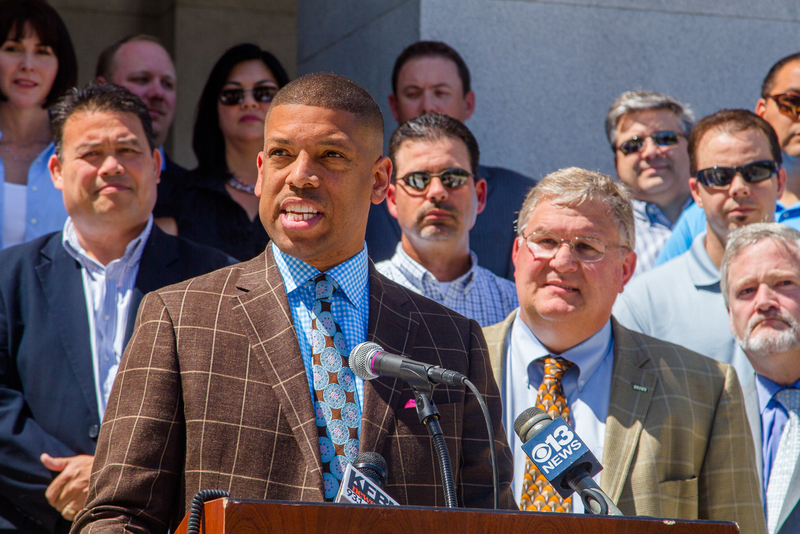 Today, Mayor Kevin Johnson joined elected officials, business, labor, agriculture and environmental interests on the steps of the Capitol in 100 degree heat to call on the state to act quickly on a water bond that benefits the entire state as the state suffers through its third year of drought. “Our current water system was a technological and engineering marvel of the 20th century and we can do the same in the 21st century,” said Sacramento Mayor Kevin Johnson. “This issue demands that we find forward-thinking solutions and we’re here today to show our commitment to working with Gov. Brown, legislators, our regional partners and statewide water interests to find a common-sense solution for all of California. This solution includes investing in infrastructure, protecting this region’s water supply, economy and environmental assets and committing to responsible stewardship of our water resources so that we can continue to do more with less,” said Johnson.